I first stumbled upon Lily and Madeleine's voices in 2013 through Son Lux's "Lost It To Trying." In that song the sisters harmonize with Ryan Lott almost seamlessly, but the ethereal quality of their voices had them standing out as something different. I searched out their output, which at the time was The Weight of the Globe EP and their self titled debut. Their voices sounded even better when they were the focus of songs, melding together with a beauty that balanced fragility and strength throughout their songs. It has taken me nearly two years to see Lily and Madeleine perform and that is far too long. 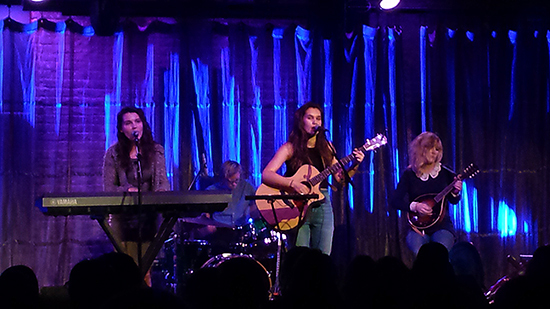 The sisters, along with Shannon Hayden, came up from Indianapolis to very packed SPACE, still one of my favorite venues, and showed off their engaging songs. Few sets start off as strong and as determined as Shannon Hayden's did on Friday night. An overlapping recording of Edie Sedgwick stood as the introduction to "Silver Superstar," leading the way for what is probably the best introduction to Hayden's music. There was an immediate grandness to her electric cello, which she loops over and over to create even more depth than the beginning moments promise. It was actually breathtaking seeing her bowing with such finesse all the while creating timed loops. The second song only added to her skill, replacing the recording of Sedgwick her own voice as an added sound to loop along with her cello and sprinkles of crackling filling in the background. At time the sounds of sparks turned more menacing, becoming loud mechanical cranking that only subsided to allow Hayden's intricate musicianship to reveal itself. Her performance was all the more impressive with the technical difficulties Hayden faced. She mused on how some people's nightmares are about school or work, but hers are encapsulated in her effect machines and pedals breaking down in the middle of show. Luckily, she recounts her effects and pedals broke down earlier during soundcheck and she was lucky enough to find a music store that outfitted her reasonable replacements. After the song "Baggage" she revealed the guitar she used for the song was borrowed from an audience member. She waited to the end of the song to even mention it just in case the song sucked. Even with mostly untested equipment, Hayden was able to keep her humor up and produce a beautiful set. Throughout her set Hayden was joined by Kate Siefker on drums. Together they crated the Little Dragon cover "A New" into an ornate center piece of the set. Hayden's voice intertwined with her cello and Siefker's magnificent drumming into a warm intimacy that truly stood tall against the original song. A similar intimacy was readily apparent in "1960s Black and White" where Hayden's voice was inline the faintest of whispers, sounding breathy and lovely as it barely escaped her body. She end her set with "Building Not Burning," certainly leaving a good portion of the crowd as newfound fans. Lily and Madeleine didn't take too much time to get to the stage and start their show. their wasn't any pomp and circumstance or even an ounce of ego coming from them. The sisters quickly took their spots, Lily standing with a sense of stoic determination with her guitar in hand while Madeleine beamed humbly behind her keyboard. They and their band mates Hayden and Siefker exuded confidence without ever boasting it as they delved into "Fumes" and "Rabbit," the opening tracks of their latest album of the same name. This show at SPACE was the first in a few months for the pair, something that Madeleine more or less called a hiatus due to their status as part time students. Their was a bit of lament in that fact in the sisters and the crowd a like, but there was nothing to worry about as they revealed having plenty of songs tucked away. They couldn't perform to many of them that evening due that the distance between them and their collaborators (Shannon Hayden plays cello on every song on Fumes) impeding practice. However were able to share "Midwest Kid," a song which they had just debuted earlier this year through Audiotree. 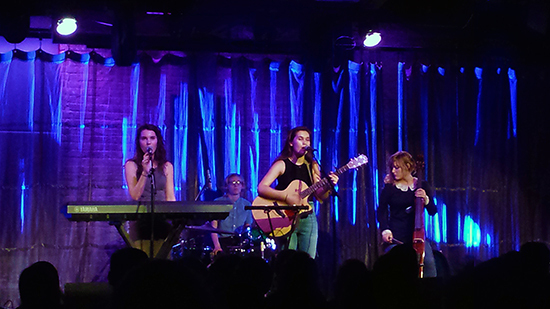 Despite having a little under three years of recordings, the sisters' musical repertoire is lengthy enough to warrant fan favorites, especially among the crowd at SPACE. Lily and Madeleine didn't just stick to last years great Fumes, instead opting to fill their set with as much of their history together. "In The Middle" off their debut EP still harnesses the surprisingly serene sadness of its waiting, while "And Tonight" from their first full-length matched the aching calm with it's in the moment certainty. "And tonight I feel there's not much left to prove" rang out with every bit of confidence it deserved. Whether lyrics are evidently personal or metaphorically so, these women place a noticeable allure to their singing. They finished off their proper set with Fumes' final song "Blue Blades" that evokes some of their most strained and tragic imagery, further expanding the lengths their songwriting ability. The most punctuated moment of beauty from Lily and Madeleine came at the end of the evening. They stepped off the stage for a brief rest, letting the loud applause from the indebted crowd bellow for their return. The sisters came up on their own, switching spots as Lily moved over to the keys. Before they had situated themselves an incredibly enthusiastic fan shout out "Sea Of Love" and the duo didn't miss a single beat, going straight into the Phil Phillips cover. Every note of the song arrived with delicate urgency, especially for those familiar with the hit who mouthed along. Lily and Madeleine traded off verses before meeting together for the final segment of the song, sending the crowd of with that lovely embrace of a song.